There is a strong case for more hands, including international support, to undertake what has been described as the most ambitious nuclear clean-up in history. It is not just the scale of the tsunami’s destruction of the nuclear power plant at Fukushima in Japan two years ago, made worse by the meltdowns at some reactors and hydrogen explosions. It is not just the difficulty of the physical conditions and decommissioning process that could perhaps take up to 40 years. It is also because of the ineptness of the plant’s operator, Tokyo Electric Power (Tepco), as Japanese media has charged. This became glaringly obvious when the head of Japan’s Nuclear Regulation Authority, Shunichi Tanaka, roundly criticised the company recently for its failings. 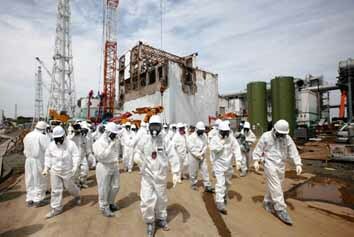 International nuclear experts invited to assist Tepco were more blunt. Railing at the operator, one of them said: "You don’t know what you are doing… you do not have a plan and… you are not doing all you can to protect the environment and the people." The extraordinary outbursts came after a series of missteps and failure by Tepco to disclose the seriousness of the problems. Incredibly, it has only lately conceded that cancer-causing radioactive materials had leaked out of the crippled plant into the ocean – something which probably has been going on for two years, according to Tanaka. The lack of transparency despite the grave risks is bad enough. Worse were the flat denials of any contamination earlier issued by Tepco although the evidence was "overwhelming", as described by Tanaka. Is it any wonder many Japanese have lost faith in Tepco’s willingness to uphold high standards of safety and its ability to clean up the mess? The substantially nationalised company is also pushing to restart its idling nuclear reactors elsewhere, notwithstanding the enormity of the problems at Fukushima. The latter was brought into relief when Tanaka admitted that neither the regulator nor Tepco knows the exact locations of the leaks and how to prevent them. Contaminated water caught is being put into tanks that are already 85 per cent full. Even though the tanks’ steel bolts are expected to degenerate and Tepco has no idea how long they will hold, it wants to double holding capacity over the next three years. Damningly, it has no plan beyond this. Now more than ever, Tokyo should act to supervise the clean-up more closely and to harness more international expertise. The media had earlier noted that foreign firms are hardly involved in developing technologies for dealing with the smouldering reactors. Leaving it entirely to Tepco would be tantamount to playing with an unstoppable fire.